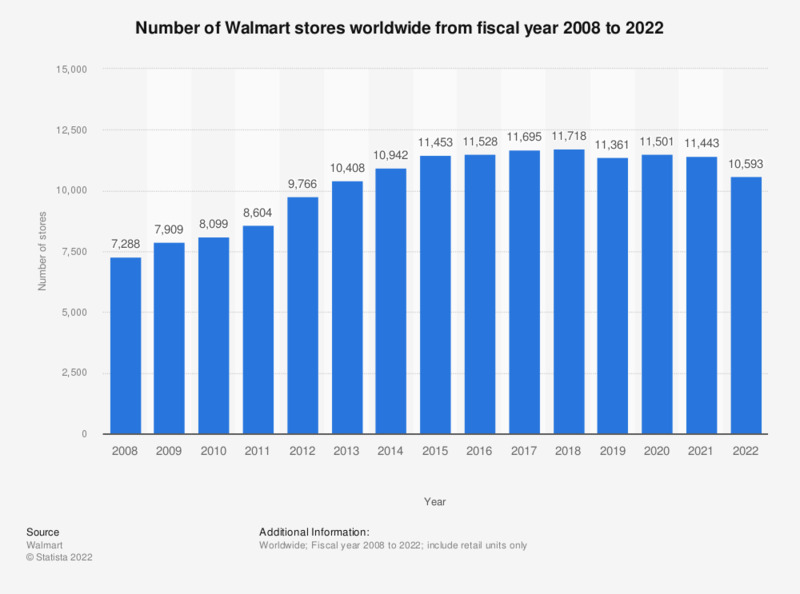 This timeline shows the total number of Walmart stores worldwide from 2008 to 2019. In 2019, Walmart operated a total of 11,766 stores throughout the world. Wal-Mart was founded in 1962 by Sam Walton when he and his brother James “Bud” Walton opened the first Wal-Mart Discount City in Rogers, Arkansas. Since then, Wal-Mart has grown to become the largest publicly-owned retail company in the world. In the United States, the company includes Wal-Mart discount stores, Supercenters, Neighborhood Markets, and Sam’s Club warehouse membership clubs. The company also has many international operations. Wal-Mart is considered a variety store which focuses on low prices featuring apparel as well as hard goods, and has been committed to upholding their basic value of customer service. Beginning in the early 1990s, Wal-Mart went to great lengths to increase their market share. They introduced a full line of groceries into their stores, diversified their market by appealing to certain ethnic groups through bilingual advertisements, and took steps to promote the awareness of environmental issues. In the 2017 fiscal year, Wal-Mart operated over eleven thousand stores worldwide; with about 4,672 of those stores located in the United States alone. Even though Wal-Mart has been criticized for their low wages, they claim to do a lot of good for lower income households. Figures show that a family can save about one thousand U.S. dollars a year with their ability to cut prices on some products, such as toys, by thirty percent in order to stimulate more sales.